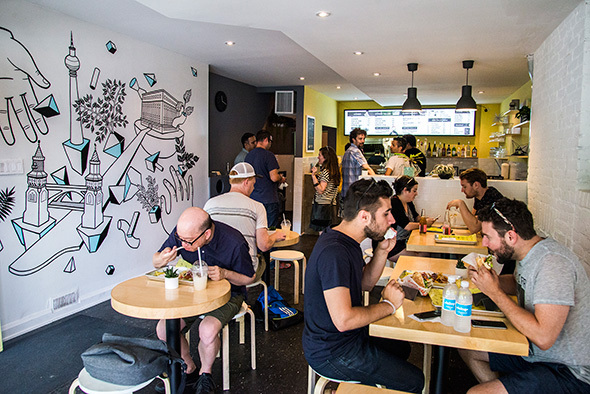 Otto's Berlin Doner is a sandwich shop in Kensington Market that specializes in German street foods. It's owned and operated by Nancy Chen, Konrad Droeske, Thomas Masmejean, and Matt Eckensweiler - the quartet are known throughout Toronto for throwing parties and festivals . 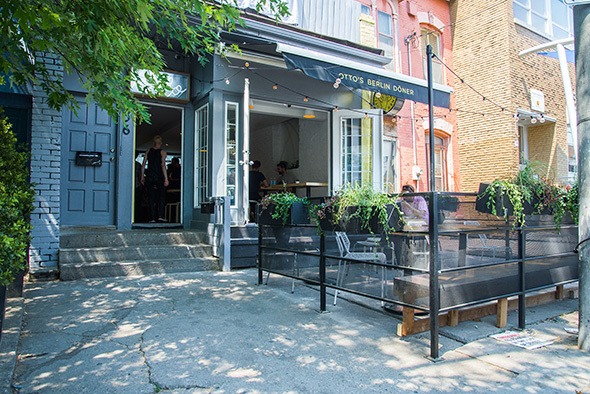 It's their love of techno music that brought them to Berlin originally, and has now spurred them to introduce the famous European street food to Hogtown. 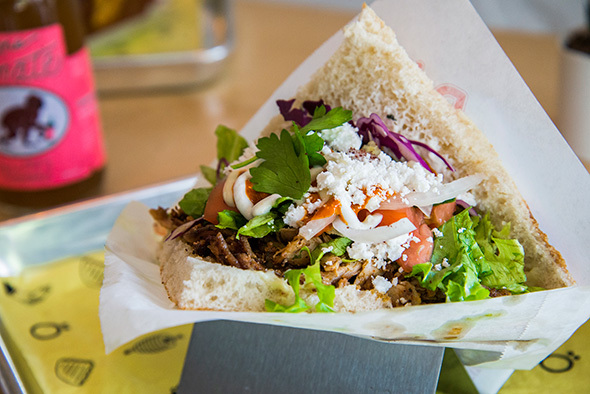 So what is it that distinguishes a Berlin döner? The dish is already a variation of a Turkish delicacy, but this sandwich ($7.95) starts with fladenbrot , a circular flatbread that's quartered then pressed before being filled with a choice of chicken, veal and lamb, fried halloumi, or gemüse (a vegan mix of eggplant, zucchini, peppers, garlic, onions and secret spices). Chef Steve Nguyen (ex- Auberge du Pommier , Terroni ) dresses these döner with yogurt sauce and a harissa-like hot sauce, plus red cabbage, chopped cucumbers, tomatoes, onions and lettuce. Fries and feta are optional upgrades priced at 50 cents each. The trick to eating this beast, is to start on one side, eat across and then alternate to the other side. 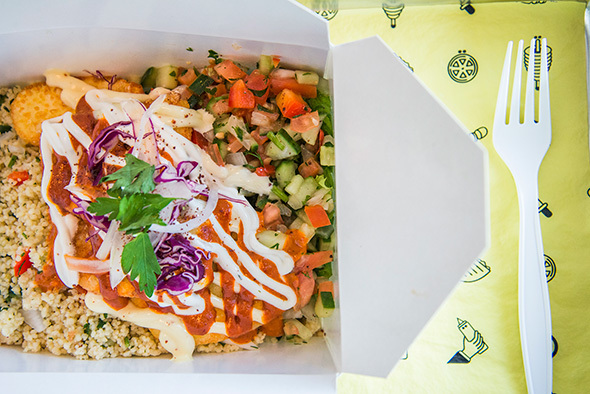 Aside from sandwiches, the menu offers Döner Teller ($9.95), a breadless boxed version featuring the same selection of meats, cheese, or veg built on a base of couscous, fries, or salad. 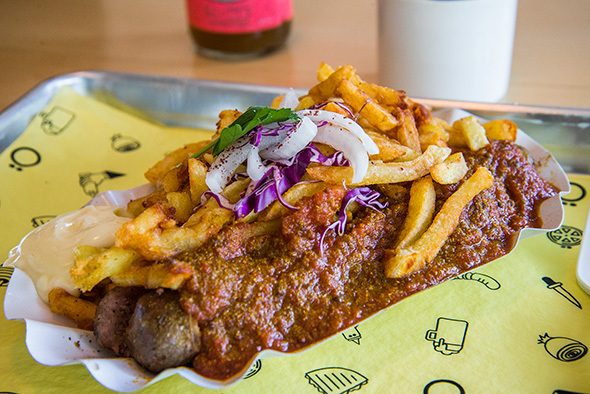 There's also currywurst ($7.95), which in my opinion steals the whole show. The sausages, a choice of bratwurst or weisswurst, are commissioned by Olliffe . They're sliced into discs and then smothered with a rich tomato based curry sauce and served with fries and a dollop of house-made garlic aioli. 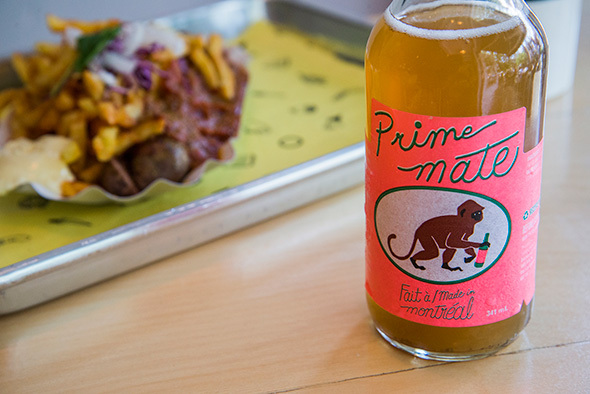 To drink there's bottles of Prime Mate ($3.80), a Montreal-made version of the caffeinated carbonated mate-extract beverage Club Mate. It tastes a little malty to start but then has a fruity finish - I especially like that it's not too sweet. While the dining room feels very casual and operates like a fast food joint, Otto's indulges the very-European custom of enjoying a drink with any meal. 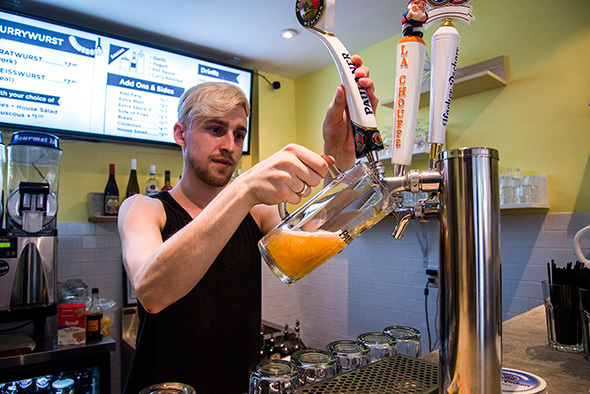 There's a limited list of affordable wines by the glass ($6.95-$7.95) or bottle ($27-$35.40), plus German and Belgian beers on tap ($6.85 per pint) and a collection of primarily German bottles ($6 and up) with a few local options for good measure. Otto's is open Wednesday through Sunday for lunch and dinner, but best of all, on weekends the intent is to stay open until at least 3am. Bless these club kids and their total disregard for sleep.